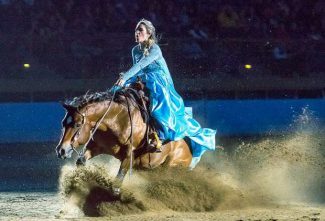 The 2017 National Western Stock Show runs Jan. 7-22 at the National Western Complex in Denver, 4655 Humboldt St. For more information and a complete list of stock show events, go to http://www.nationalwestern.com. Grounds admission and event tickets are available at nationalwestern.com and all King Soopers locations. 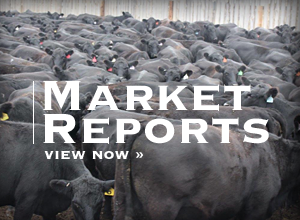 » The 2016 stock show was the 110th anniversary of the event. It brought in the second-highest attendance in stock show history with 686,745 visitors. The only year with higher attendance was 2006, the 100 year anniversary of the event, which drew 726,972 attendees. » The Yards will haul in 40 semis full of shavings and 14 semis full of straw for the 16-day event. After the show is over, it will take 65 semis to haul away the manure for recycling. 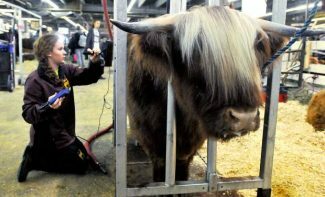 » More than 15,000 head of livestock and horses will be on the stock show grounds, as well as 25 different cattle breeds. » National Western estimates $10 million in livestock sales will take place during the 16-day event. » The stock show drives about $100 million in economic impact for the Denver area, and raises about $400,000 in scholarship funds for the National Western Scholarship Trust. » In 2016, the top eight animals at the Junior Livestock Auction set an all-time record high of $412,000. “1899 – Organized livestock events begin in Denver, but not on a regular basis. 1906 –First show opened on Monday January 29 and ran for six days. Attendance was estimated at 15,000 and the Grand Champion steer sold for 33 cents a pound. 1909 – The 1909 show opened on January 18 in the newly constructed 6,000 seat National Amphitheater, erected for $200,000 provided by the Denver Union Stockyard Company. This building still stands today. 1915 – The only year the show was cancelled due to a “hoof and mouth” disease epidemic, which prohibited livestock from crossing state lines. 1916 – The Livestock Exchange Building opened as the main building for Denver Union Stockyard Company. 1919 – The Brown Palace Hotel paid a record 50 cents a pound for the Grand Champion steer. 1922 – A program for admitting Denver and suburban school children to the show was established. 1931 – The 25th National Western presented the first Rodeo in conjunction with the Livestock and Horse Show. 1935 – The first Catch-A-Calf contest was held during the show. 1941 – The Grand Champion steer at the 1941 National Western was exhibited by 12 year old Kenny Monfort of Greeley. 1943 – The Executive Committee decided to invest all profits in War Bonds. The show was confined to “local” participation because of travel and fuel limitations caused by World War II. 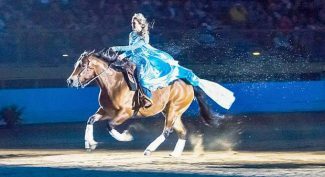 1944 – The Quarter Horse Show and Sale were introduced at the show. 1947 – Denver taxpayers passed a $1.5 million bond issue for the building of the Denver Coliseum. 1952 – The Denver Coliseum was finally dedicated on January 10 for the 46th National Western. 1954 – The Westernaires made their first appearance at the Rodeo. 1974 – Competition for girls was added to the 1974 Catch-A-Calf contest. 1981 – The show increased to 12 days and included 21 Rodeo performances. A still-standing record of $301,000 was paid at auction for a Hereford bull. 1993 – Mutton Bustin’ for kids becomes a popular new attraction at the Rodeo, which had a record attendance of its own with a crowd of 178,012, the most since 1986. 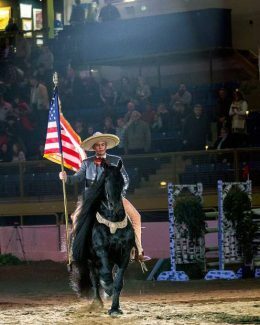 1996 – The 90th National Western Stock Show was expanded to 16 days, with 23 Rodeo performances, 11 Horse Shows performances and two Mexican Rodeo Extravaganzas. Attendance exceeds 600,000. 2006 – National Western celebrates its 100th anniversary! The show’s attendance reached 726,972 for the 16-day show and the grand champion steer sold for $75,000 or $58 per pound! 2015 — Voters approve tax extension to pay for new National Western Center, a reimagined and renovated complex for not only the January show, but ag events year-round at the same location on Humboldt in Denver. 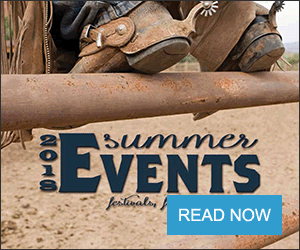 All these events, except the 2015 voter action, were taken directly from the National Western Timeline, which can be found in its entirety at http://www.nationalwestern.com/about/history/. TZ Bucking Bulls, the ranch and rodeo stock company of Ty Rinaldo, is hosting its fifth annual Castle Rock Bull Riding event Feb. 18 at the Douglas County Fairgrounds. The bulls will buck from 2-7 p.m. For more information on this event, including ticketing, contact Ty Rinaldo at (719) 641-3233. It's been 65 years since Chuck Sylvester showed his first steer at the National Western Stock Show. By then, he'd already been attending the event for about a decade. It was like home to him. That steer show was in 1952, the year the Denver Coliseum was dedicated and opened for the 46th annual NWSS. 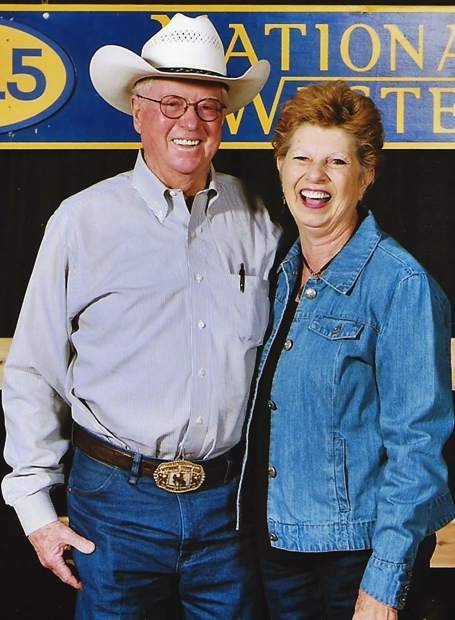 Even now, as the National Western Complex prepares for another major facelift, the stock show will always feel like home to 79-year-old Sylvester and his wife, Roni. He's seen the changes over the years, from development on the grounds to the event nearly doubling in length from nine to 16 days. The change in attendance has also been drastic, he said — at least three times as many people go to the show now — and that's largely because of a change in who the event is marketed toward. "(It's gone) from the old facility, which was originally a show or convention for rural people in ranching and agriculture, to more modern and inclusive of urban. 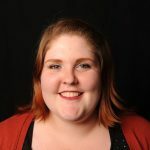 Through all kinds of connective events, the show includes urbanites," Sylvester said. "It gave me great pleasure to hear the laughs and squeals of children both rural and urban." When he was a child, he remembers his favorite events were the rodeos. Even now, Sylvester remembers the name of the rodeo announcer — Cy Tallion — and how much he enjoyed listening to him. In 1968, after spending nearly every January at the stock show — he missed one in 1959 — Sylvester became the superintendent of the judging contests for 4-H, FFA and college students. He held that position from 1968 to 1972. Then, he was the manager of the yards from 1975 to 1978. After that, he took the position of the general manager of the entire stock show until 2003. When he retired, National Western retired the position. "(It was) a boyhood dream come true," Sylvester said. Every year, the Sylvesters buy season tickets to National Western. They pick and choose what events they want to attend, then they share the wealth with family and friends, giving away tickets to some of the other 20-plus events. Sharing the ag experience is what the stock show has always been about for Sylvester. For bucking bull contractor Ty Rinaldo, that's what the show is for, too. He brings his bulls in for several of the rodeo events so they can wow crowds and show everyone what he and his family do year-round. "We are honored to bring bulls to such a great event," Rinaldo said. 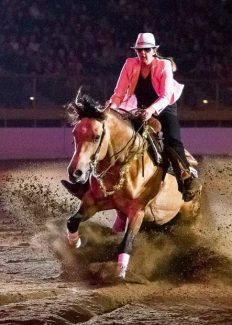 "My history at NWSS has gone from a little kid who's yearly highlight was the Denver Rodeo, to a (Professional Rodeo Cowboys Association) Bull Riding Contestant, to a (Professional Bull Riders) judge and now a PRCA and PBR bull contractor. I have enjoyed every aspect and it is still one of my all-time favorite events." Last year, one of the bulls from TZ Bucking Bulls, Rinaldo's ranch, had the highest marked bull ride of the show at National Western with a score of 91.5 during the finals. This year, Rinaldo will bring 15 bulls to buck at different times, he said — 10 during the Colorado vs. The World Rodeo on Jan. 7 and 9 during the PBR event Jan. 9. Further scheduling information wasn't available at publication time. For the Rinaldos, National Western has always been a family affair. The Rinaldo family has been attending the show each year for more than 60 years, and Ty Rinaldo has hauled in bulls for the rodeos since 2000. 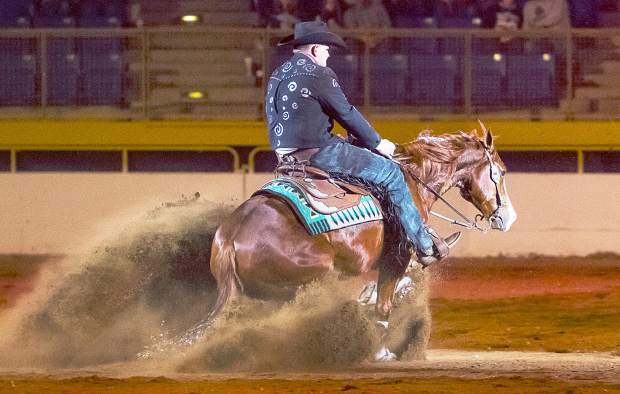 "(My) mom and dad showed horses and steers in 4-H. My grandparents and parents showed horses in the (American Quarter Horse Association) from back in the '50s. It didn't take long for my little brother and I to know every square inch of that place," Rinaldo said. "We liked to hang around the rodeos more than the horse show end." Rinaldo's oldest son, Tanner, won the stick horse rodeo when he was a little boy, and brought home three trophies "twice his height" in sheep riding contests. While the now 20-year-old Tanner and his younger brother, 17-year-old Tucker, don't compete in any events anymore and don't ride bulls like their father used to, they are still active in helping run the family business. A few days before the show kicked off, Rinaldo was busy running errands, but his sons and wife, Nancy, were busy at the ranch in Larkspur, feeding the bulls in minus 4 degree, snowy weather. "They are hard workers at home and at the events," Rinaldo said. "From loading, driving, sorting, flanking and everything in between, they can do it all." When Sylvester thinks back to standout moments over his stock show career, they're littered across 7 decades — some are from when he was a kid and some are from when his own children, Lois and the late Duane, showed hogs. Duane caught the catch-a-calf at the show one year.